Total Fisherman Guide Service is a local Portland fishing guide service specializing in fishing the beautiful and productive waters in and around the greater Portland, Oregon area as well as all of NW Oregon. Guided fishing in the Portland area provides great opportunity for Chinook salmon for several months of the year, fantastic sturgeon fishing all year long, and don't forget our beautiful summer and winter steelhead! Portland Oregon's close proximity to both the Columbia River and Willamette River make it a hub for some of the North West's finest fishing! We provide all of your tackle, bait, and fish filleting. All you need to bring is a smile, your lunch, a fishing license and something to take your fish home in! 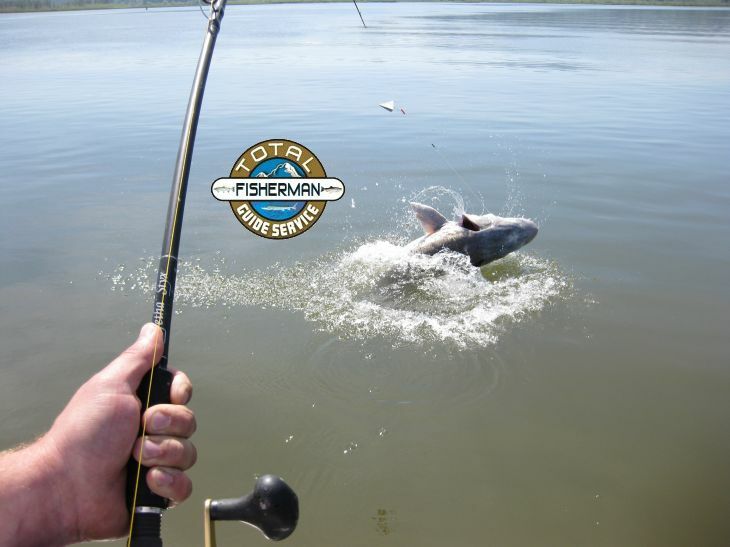 The best time to fish in Portland is whenever you have the opportunity, there is always something to fish for here so let us know what the time frame for your fishing trip is, and we can let you know what your best options are. 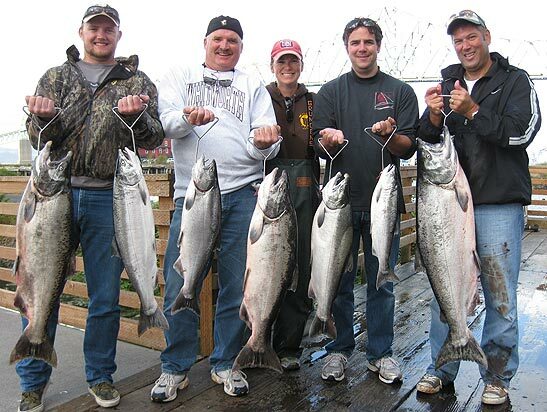 Our fishing seasons in the Portland, Oregon area go year around but in general break down into the following seasons. Sturgeon are the largest game fish in North America and wow do they fight hard! Not only are they great fighters but they are great biters, sturgeon love to eat and catching them in large numbers is a lot of fun and a great way to spend the day! 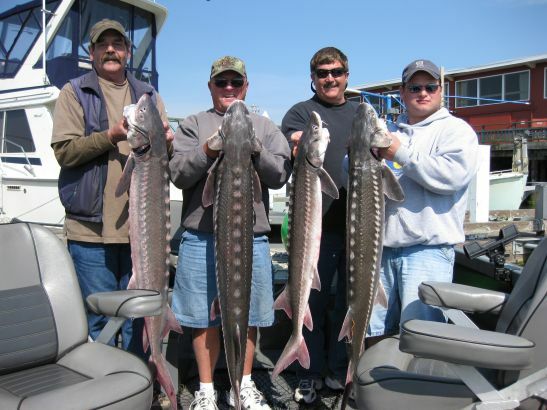 Portland fishing charters for sturgeon run all year long, however there are times when the fishing is catch and release only and keeping them isn't allowed. During the fall and winter our sturgeon fishing in Portland is best on the Willamette River. 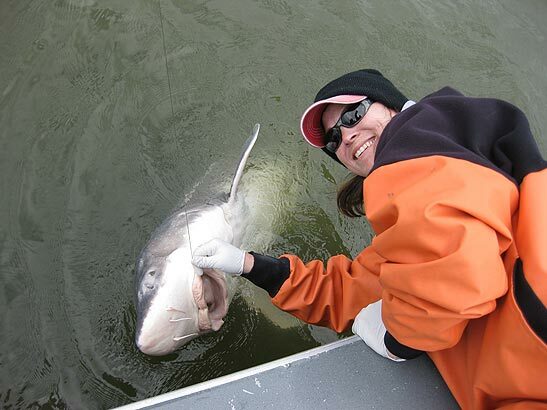 The Willamette sturgeon population is very large and high numbers of fish are caught during this time! 15 to 30 fish and higher is an average catch for the boat. During spring months we are running Willamette River catch and release trips seven days a week, as well as catch and keep trips on the Columbia River on Thursday, Friday and Saturday. Come join one of our charters and catch the largest game fish in North America! Salmon fishing in Portland, Oregon isn't just something we do ... it's who we are! Chinook salmon are an Oregon icon and the people that live here and the anglers that fish here wouldn't be the same without them. When the salmon are running, they're the talk of the town! From the newspaper, to the evening news, coffee shops, and restaurants, everyone has salmon on their mind! Our first salmon run of the year begins in February and runs through May into June with March, April and May being the best months to catch these fish. We start our guided spring chinook trips in mid March. Spring Chinook also called "Springers" average 14 to 25 pounds and are the finest eating salmon in the world. They stay chrome bright until their spawning period in August and September and they are the crown jewel of Portland Oregon's salmon runs! 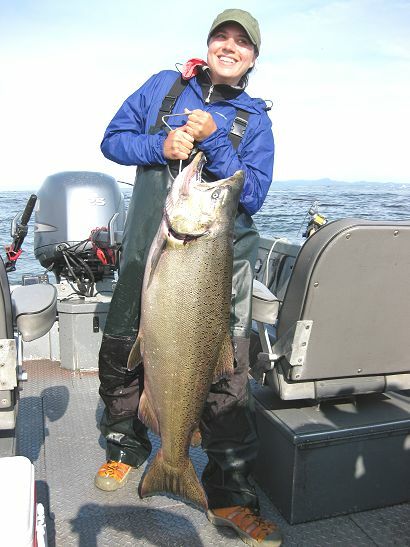 Fall Chinook "Kings" and Coho "Silvers" enter the Columbia River starting in August and continue through October. Our fall salmon runs are the largest of the year with some years having a combined run exceeding one million fish! Trolling is our primary technique for catching salmon. As Portland Oregon fishing guides we have found over the years that trolling is one of the most effective and fun ways to catch salmon. Our fall Coho Salmon average 12 to 15 pounds and these silver acrobats are a blast on light tackle! 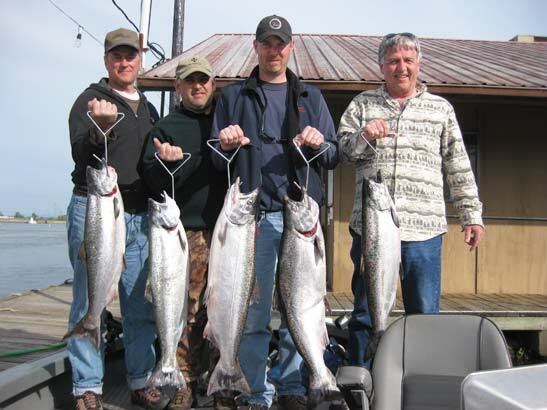 Columbia River fall Chinook average 20 to 35 pounds with some exceeding 50 pounds! 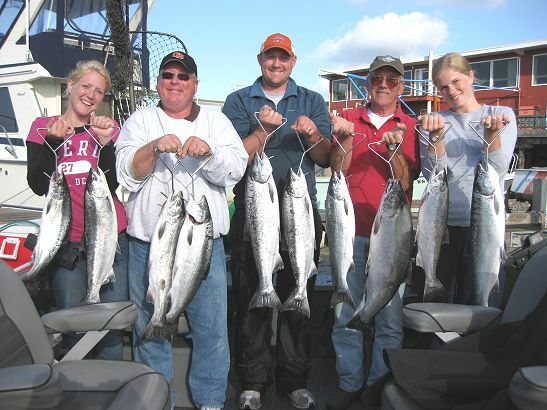 Come join professional Portland fishing guides Kevin and Lacey for a fishing trip of a lifetime! Please make sure you check out our whole web site to see more about the incredible guided fishing trips and charters that we provide, and please don't hesitate to call us with any questions that you may have. We love talking fishing!